Staff Sergeant Richard Sturm, conducting combat operations with the US Army 1st Infantry Division in Baquba, Iraq. The US Army has been preparing for the possibility of a bloody week in Baquba, one of the most restive areas of Iraq. Though Baquba and surrounds are in the news daily, most Americans seem to have never heard the name. Perhaps this is because many reports of fighting around Baquba, when reported at all, are referred to as, "just north of Baghdad," or "near Baghdad." Journalists rarely venture into this backwater, though it is only a short drive from the capital. 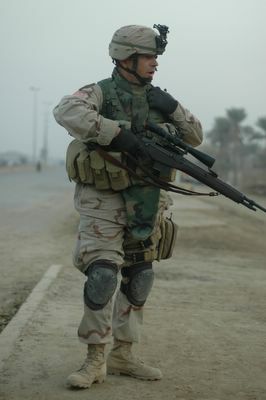 In advance of Iraq’s first elections, Coalition forces around Iraq have been preparing to defend against election-day attacks on January 30, 2005. In Baquba, those defenses have included aggressive and nearly nonstop raids for weeks in advance, netting arms caches, explosives, and people suspected of attacking Iraqi civilians and Americans. "We plan to keep them on their heels," Lt. Col. Todd told me in his office at Forward Operating Base Warhorse in Baquba. "We plan to hit them and hit them, and keep our fingers in their chests and keep them off balance until the elections. They cannot mount effective attacks if they are on the run, and we plan to keep them on the run. Looking over their shoulders. Wondering what we will do next." And yet the alerts continue: "Counterfire, counterfire, counterfire," a voice crackles over the radio as Army radar detects enemy mortars firing. A nearby American artillery battery is cleared to fire and Boom! Boom! Boom! The Army replies with deadly accuracy. Around the clock, the US Army in Baquba launches small, Unmanned Aerial Vehicles (UAVs)—the tiny Ravens and the larger Shadow—sometimes circling target houses waiting for suspects to come or go. Some nights I go on the raids, other nights I sit and watch the live feed coming down from the UAVs. The American troops swoop in, operating in Baquba at will, often encountering bombs planted to kill them, sometimes encountering stiff resistance, but always delivering more punishment to the insurgents than the insurgents can manage to swallow. If the insurgents are worthy enemies, so are the soldiers in the US Army 1st Infantry Division. And this week, the insurgents and the 1st Infantry Division, along with the Iraqi Police and Army, are in for a bloody showdown; if the insurgents are successful in derailing elections, they will gain an important psychological victory. But if the elections are deemed successful, maybe—just maybe—democracy will gain purchase in this volatile region.